Creating and teaching art requires a sense of humor and an understanding of organized chaos - as there is no way to create something original without spreading out supplies and getting a little messy. Today I had the privilege to attend an Arts PD at our local University. 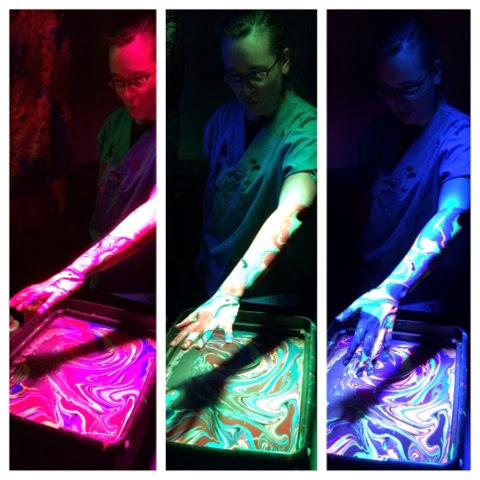 This PD wasn't for just visual arts - but for music, dance and theatre. The original brochure seemed vague - the day was to be dedicated about teaching for student expression. No keynote, no session to pick between - I wasn't really sure what we were getting into. All I knew was that the district was paying for us to go and I would get to spend the day talking about what I actually do instead of talking about reading/math or some other initiative that I would need to modify/alter into my room. So, I figured, even if it wasn't a great conference, it would be WAY better than the alternative. Well, as it turned out - it was fabulous. The seemingly vague brochure was right on target- we spent the day around the theme of 'expression' and there weren't keynotes or labeled sessions because it was very organic. There was light direction, but that was it - the attendees were allowed to move through the day and be inspired where they were at. We watched and experienced a bunch of university students in their craft. We talked with them in an honest dialogue about how they got to where they are - what inspired them. Where or who made them decide to major in the arts. We talked in breakout session with our colleagues about key words and phrases about what we teach, why we teach. We came back together and shared those lists. We ate a FABULOUS lunch which included some of the best chocolate cake, well besides my mom's. In the afternoon we watched a professional dance group that is doing a residency at the university. They have a very unique company which provides a lot of improv from the dancers as well as the audience and composer. It was beautiful, and surprisingly moving. I found myself lost in the movement along with the composition - tears stinging in my eyes. In one of our table talks, when we were wrapping up our day - our discussion leader looked at me and asked, "So, when do you have time to make your own art?" I am sure this was meant to lead into the fact that many art teachers don't have time or the energy to keep up with their own work.... but I was never an artist first. 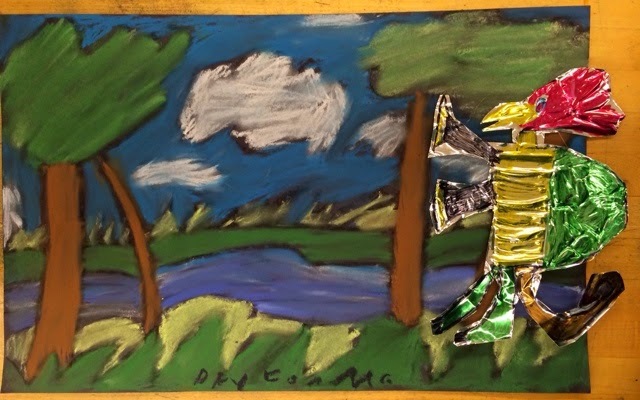 Many arts teachers started out as a musician or visual artist first - then decided to teach. I'm one of the few that didn't fall into art education that way. I went through school feel stupid. I didn't mind school - but it sucked for me. I was good at art, enjoyed art. I loved doing crafts at home - making bracelets, painting, pearler beads..... but that was never viewed as 'important' or 'smart'. It was seen as cute and crafty. It wasn't till college that I had my moment where I went "huh - this is how normal people feel in class". I was sitting in my weaving class and one of the only students who 'understood' the warping board and how to dress a loom without notes. It was in the moment where I went "no one expressed to me that art could be a job - that I was smart and good at something I could make a living at". So, I went into art education wanting to be the person I never had. I think though - when looking back on the day, the most powerful part was realizing that we spent the ENTIRE day talking about teaching and students and the word 'rubric' 'lesson plan' 'student growth' 'data' weren't really mentioned or key noted in any discussion. 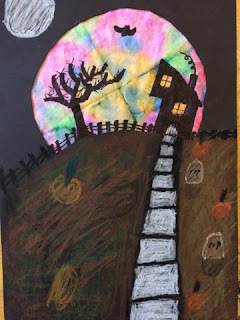 When we discussed what we teach- no one mentioned a lesson, or color theory, or perspective -- it was all about opportunity, mistakes, failing, asking for help, trying again, trusting, and exploring. The arts teach their own skills and foundations based on their craft, but what everyone is really teaching is expression and how to start, fail, try again -- how to preserver. The arts are beautifully, gorgeously messy. I have no idea what to call this project - but it is really amazing and cool. I got the majority of this lesson from smART Class, and then tweaked parts. 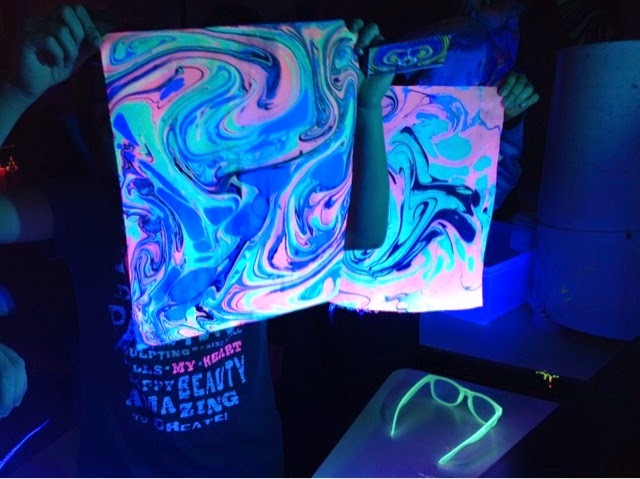 The high contrast, and visually dynamic product was perfect for my fourth graders. The first day students and I reviewed what they know about colors - which colors mix to make others, which ones work well together, which ones make brown... etc. 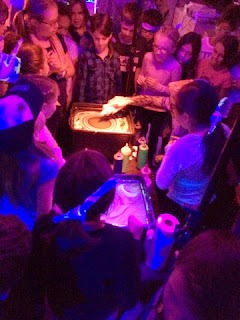 Then we passed out liquid watercolors (honestly, never going back to cake watercolors), and two coffee filters per student. Students were in charge of folding their coffee filters in half, twice, getting a paint brush and painting them. This seems easy and perhaps 'boring' but the kiddos LOVED it. The coffee filters absorb and bleed the colors around and into each other - something paper normally won't do. It was fascinating. The first class I introduced this to, I also planned to have them cut out their black paper - but only two kids got that far, so for rest of the classes we just enjoyed the painting. Pumpkin patch and skeletons coming out of graves! The second day I introduced what we were going to do with these filters. (I purposefully did not tell them when they were painting, because I didn't want them to over plan). I stressed to them that they did not have to do Fall or Halloween - but anything: a normal day, Christmas, Easter, a pretend place. Our goal, rather, was to use shapes and size to help communicate to our audience what was happening not to do just Halloween. Next, students used a tracer to trace and cut out a hole on their paper. Next, students unfolded their dry coffee filters and picked which one to use for their project. (I had students make two so that if they hated one they had another choice, and if they made a mistake on their coffee filter that we couldn't solve they had a back up). They taped their coffee filters on the back of their paper, flipped it over and went to work drawing with a Sharpie in silhouette style. 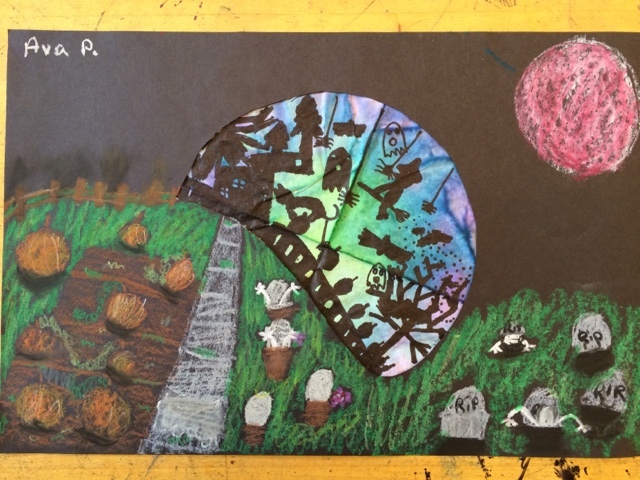 Some students really struggled with the idea of silhouette and others nailed it. I think, in the future, I will try and introduce silhouette more purposefully and see if that helps. The simple added detail of a house number. The third week we busted out the oil pastels and grew our picture out into the black. 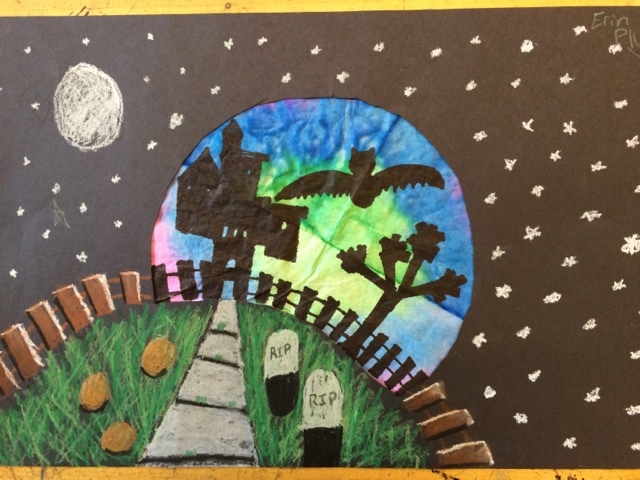 I encouraged students to take what they had already draw and continue that into the black space. We did part of one on the board together - they brainstormed a bunch of ideas for me and then I did a 'think aloud' where I said everything I was thinking, including mistakes and changing my mind about things. I reminded and encouraged students to use their knowledge about perspective - things far away appear smaller and things closer appear larger. 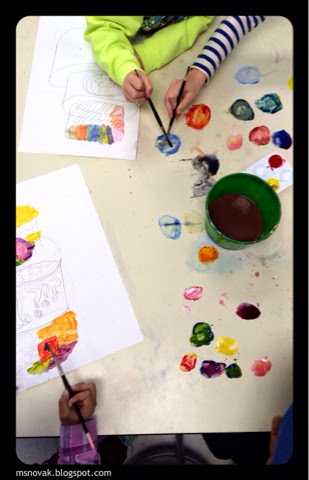 I also showed them how wonderfully oil pastels layer and blend. I encouraged them to use more than one color for each part of their picture - if you have pumpkins, do more than just one color of orange. I would show them and they would all 'ooooh' 'ahhh - that looks so real'. I then, turned them loose. Many remembered about perspective and applied it, some still are struggling with the idea that sidewalks should appear larger at one end. "Find yours on the board. When you have found it, please point at it so I know you found it." And the field goal is good! "Put your hands down and look at your own work. Find something you feel you did a good job on. When you have something, raise your hand. (wait for all hands). Please share quietly with someone next to you". "Look at the projects and find one, that isn't yours, that captures your attention. For some reason out of all of them you keep coming back to this particular one. Raise your hand when you have one. (wait for hands). Now look at it more closely, maybe compare it to others around it - what about it captures your attention? Notice I didn't ask which one you liked - I asked which one captured your attention and why. 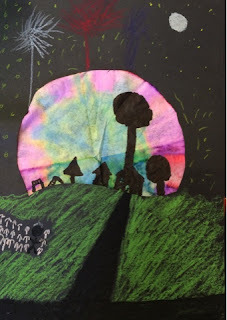 When you share please use your artist words to describe what captured your attention for example: Ava's really captured my attention because the texture of her grass makes it look like its blowing in the wind. NOT: I like Ava's because it is pretty. Share with your neighbor about which one captures your attention and why." Snow angles and the Aurora Borealis. "Anyone want to share out to the class about which one captures their attention and why?" -- As kids do this I do not agree or disagree with their picks - simply "okay" and call on another. This review is not about what I think. "Point at one that you feel used color really effectively -- find another"
"Point at one that you feel is very unique." "Point at one that you feel has strong craftsmanship"
"Find yours again. Look for something that you would change or add. Maybe you were inspired by another student's idea or use of material. Tell your neighbor. Does anyone want to share out what they would change?" My last post was about how burned out I felt and how I was terrified that I wouldn't love my job anymore. Well, we are seven-ish weeks into the school year and it's amazing! I really do love my job. I am a little weary that we are still in the beginning of things, but so far so good. I have really ENJOYED my students so far this year. Whenever I get stressed out, I try and remember to put it aside and be present at the moment with my kids. Am I perfect about it - heck no, but things are WAY better. My students seem happier too - they seem more willing to run with ideas and go for things - which could totally not be true. I have a lot of posts and projects to update about - lots of neat ideas I have gathered and then introduced to my kiddos. I will try and get some posted today, but first I have some bulletin boards I need to finish. For more timely updates and pictures of what is going on in my classroom - follow Organized Chaos on Facebook. Okay. Let's be honest for a moment - the last handful of years have been tough for me in the teaching world. There have been lots of changes, and shifts in my professional realm that haven't all been easy to understand, accept, or adapt to. During these changes, I tried to give the benefit of the doubt, I tried to be positive, I tried to express my thoughts and ideas.... But I kept feeling mad, disappointed, and the worst - frustrated. I felt like everything was a fight. I felt like giving up. I felt so burned out. why I was so emotionally exhausted and fried. Did I feel frustrated and burned out because of all the changes and shifts, or because every year my job has to survive the chopping block in April when the budget has to be balanced, or from constantly having to defend and advocate for the arts, or perhaps the "honeymoon" period was finally over after 8 years. My conclusion - all of it. All of it was a contribution to my burnout. So, when the school year ended last spring and I packed up my classrooms, I decided to take the summer off - like off, off. No planning lessons in July, no planning the years units in August, no workshops, no school related books, no school email, no blog posts, no going in early (which I did break for a day). I decided to take a real break from it all to try and adjust my attitude - to let the burn out wash away. Did it work? I don't know. Teachers report back next week. I am anxious, as always, but also afraid that my burnout hasn't gone away. To be honest, I am terrified that I won't love my job like I use to. I use to be so sure that my vocation, or calling, was teaching art. I am afraid that I may have fallen into that young professional teaching statistic of burnout. I hold onto the hope that I am just in a rut - that, like everything in life, there is a fluidity to it and if I hold on long enough, it will circle back. My plan this year is to let go of everything I don't have control over, which I know is way easier said then done. I lost a lot of energy and a lot of momentum the last couple of years fighting and stressing over things I had absolutely no control over and I can't do it again. It's not good for me, it's not good for my students and it's not good for my program. So, a new year, a new plan - it's all about my kids in my classroom, it's all about making art and thinking like artists - it's about celebrating mistakes and learning to preservere, it's about providing kids with a different way to think and succeed. I can't control if the district decides to tank the arts, or a slew of other things - so let's live in the moment we have and not worry about the future. I have this year to make a difference in the lives of my students - one day, one art class at a time. A friend of mine, who has provided lots of inspiration over the years, has coined the #everydaymatters and I think I will follow him in this journey. I need to reconnect, refocus, and be present with my kids this year, because everyday does matter. So, here is to a new school year. A new vision, a new attitude, and hopefully a renewing year. So, earlier this year I mentioned that I was going to do guided sketchbooks with my upper elementary students (3-5). So far I LOVE it! The goal of the sketchbooks was to review skills, introduce skills, and even have some fun. I wanted the sketchbooks to be an activity we did to warm up the creative sides of their brains - much like warming up your voice in music, warming up your body in dance or P.E. I am not sure if it actually warms up the creative side of their brain - but I have noticed it totally focuses the kids. For the first 4 minutes of every art class the students sit at their seats with low lighting, a sketchbook page and no talking. I decided to have this silent to help their brain switch over, but also to help them focus on doing one task for only a few moments. When the time is up students attached their newest page to their sketchbook and prepare for instructions. While some kids love it and some tolerate it - I have found that these simple four minutes do A LOT for the kids and for me that I never intended. For many students that four minutes helps to reset their day/mood. 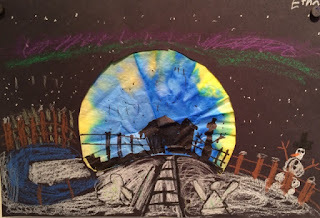 On more than one occasion I have had a student come in hot-to-trot or in tears - whether from a rough day or moment -- those four minutes in low light without talking and doing something creative will often calm them down. It also seems to focus the class as a whole when it is time to work on the current project - they are still themselves, but not quite as revved. These small four minutes at the beginning of class also provides me with some time to breathe. My classes are back to back - no 5 minutes between classes here, so when one class leaves, another is at my door. While I do my best to prep for the day - sometimes it just doesn't get done, or it can't sit out all day.... blah blah blah. So these few minutes provide me with a second to finish prepping paint, switch out the board with class objectives, or simply take a deep breath. The sketchbooks have also been great on limiting the amount of free draw paper my students consume! They may freedraw on the backs of the sketchbook pages, or work on old pages. OH! Also, having this 4 minutes at the beginning of class is great for kids who NEVER finish their projects. Instead of having them do a sketchbook page, they work on their project for those 4 minutes without talking! It is amazing how much they accomplish. So, how does this all work? Well I started gathering ideas on Pinterest this summer. Then the tough part - how I am going to have time to do all of this?!?! I went back and forth on a few ideas that ranged from pre-done books to index cards -- nothing was going to be fast and cheep. Then from somewhere in the universe the idea came to me. Use normal paper and cut it in half! I wanted to make sure the students had enough room to draw on the same side as the instructions so I cut each paper in half the long way. In word I turned my paper landscape, copy and pasted images from my sketchbook idea page, turned them sideways, and put two on each page. This way I could easily print them from either school. I print what I need for the week, use the automatic 3 hole paper puncher in the lounge (that way the holes always line up), cut in half -DONE. I did have to spend a few dollars at each school buying enough one inch binder rings to hold the whole thing together -- but it seems to work fine. "You're a fun activity once a week"
Did the title of this post make you cringe? It certainly took me off guard when a co-worker said this to me. I was in her office talking about something - venting most likely about something ridiculous that was happening, but I can't remember what exactly. All I remember was talking to her and saying something about how what I do is important too and she agreed by saying "you're a fun activity once a week". I am certain she meant it as a compliment. I am certain she has no idea how much it felt like a sucker punch. I NEVER know how to respond to comments like these, especially when I don't see them coming, especially when they come from people who I thought understood what I really do. I just don't know how to respond. Over the next few days this comment rolled around in my brain from time to time. What really bothered me about this comment? Did it bother me because it was partly true? Did it bother me because I feel I am so much more than a "fun activity"? And the answer is yes, yes to both. 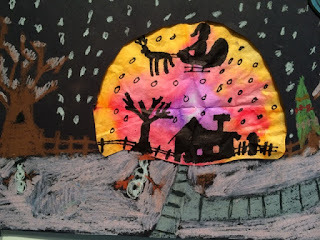 Art is once a week and it is fun - so yes, art is a fun activity once a week. Maybe this isn't such a bad thing after all. I mean, when you think about things that are 'fun' what do they have in common generally -- laughter, good feelings, people, communication, engagement, the confidence to try something new and more. I am happy to say that often the art room is all these things. I think the part about the comment that bothered me was that while art IS fun, its not the purpose of art. The purpose isn't to be fun, fun is a byproduct of doing something creative. Being creative is naturally fun - it's engaging, it's interesting, it often provides natural problem solving and critical thinking, and even natural communication points. I never plan a lesson to be 'fun' - it just happens when lessons are full of engagement and opportunities to make creative choices. So, yes, while art is a fun activity once a week - that is not the purpose of art. The purpose is to provide young minds with another way to think, a space to take risks and not even know it, to grow problem solving and critical thinking skills, and to become more themselves. In the meantime, I will try and come up with a variety of retorts to comments such as these that will help to educate those who think art is just 'fun' while honoring and owning the positives in such comments. For years I have been doing a project based on "Where the Wild Things Are". We talk about texture - real and applied. 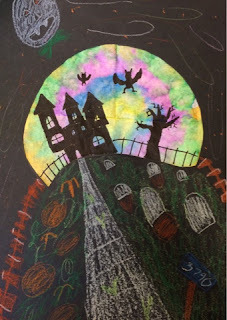 Some years I have the kids use chalk, other times colored pencils and while I always repeated the project, I was never really happy with it. I always felt that it was more flat than I wanted. Well, problem solved. I am not sure how or when the idea came to me, but BAM there it was. 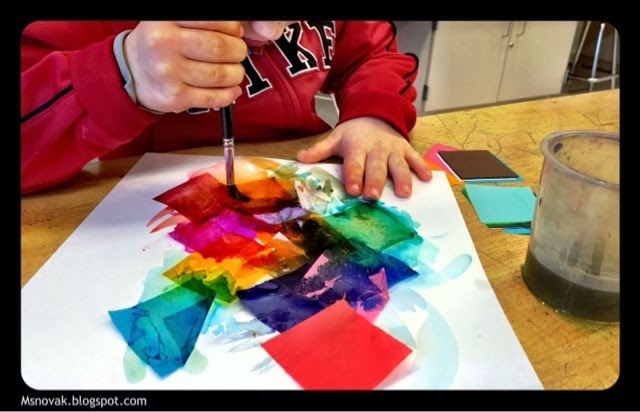 The students would make their "wild things" on aluminum and create their habitat on a background paper with bright colors and ideas! Next, we read "Where the Wild Things Are", the beloved classic. After we read the book we went back and took a long hard look at the Wild Things. We discussed their implied textures and how it looked like it felt a certain way. 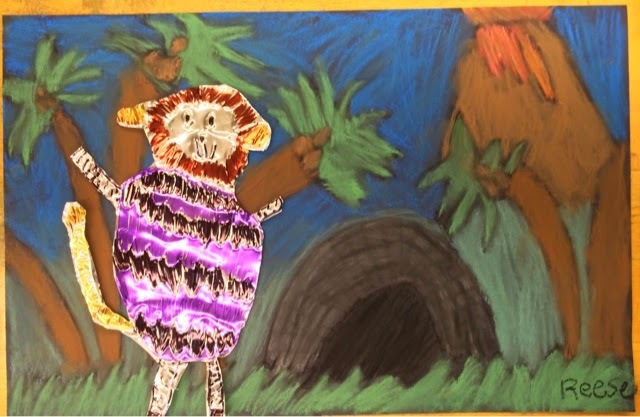 There is always ONE kid in every class that shares how each wild thing is made up of different animals which is a great segway into the project. As I send students back to their seats I ask them to think of an animal and raise their hand. 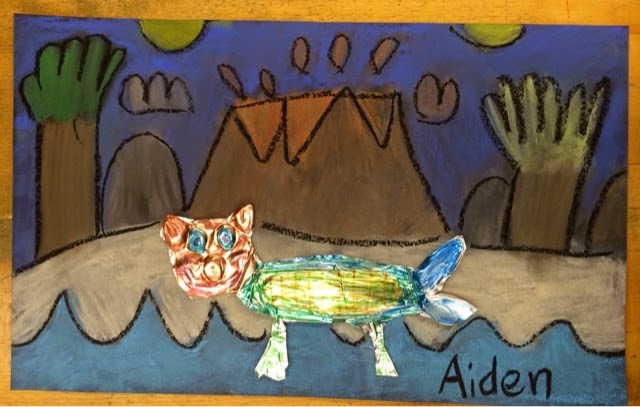 Next, students help me build an original wild thing using four or more animals. The kids tend to get real excited and a bit rowdy at this point - who can blame them when there is a tiger, turtle, wolf, snail, dragon on the board!?!? 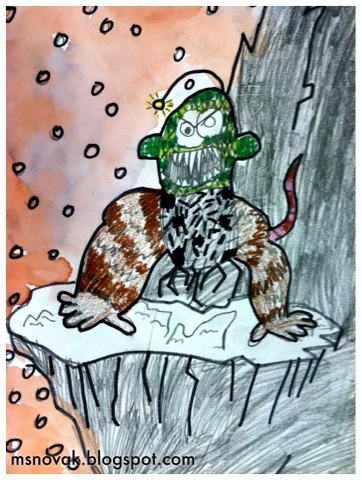 Next, the kids draw their own wild things using their own idea on a piece of paper. They need to make sure to draw their implied textures! When they are done I tape their papers onto a piece of aluminum, hand them a magazine and tell them to trace their wild thing really hard on top of the magazine. I don't tell them why, I want them to discover it themselves. Sure enough, about two seconds into tracing they figure it out - one by one and its a beautiful sight. The students realize that as they are tracing their pictures, it is transferring to the metal and you can ACTUALLY feel it - their implied texture is now actual texture. After their wild things are traced I show them how to tool their metal by pushing parts with either their pencil or a capped marker. We discuss how you have to visualize what you want and then think it through - for example: "If I want my tiger stripes to pop out on the front I need to push them in from the back" or "If I want my scales to sink into my animal, I need to push them in from the front". There is some serious visualized and planning during this step. You can almost see the gears in their brain moving as they increase their spacial thinking. After they are tooled to the students liking they color accordingly with permanent markers, which is a treat within itself. 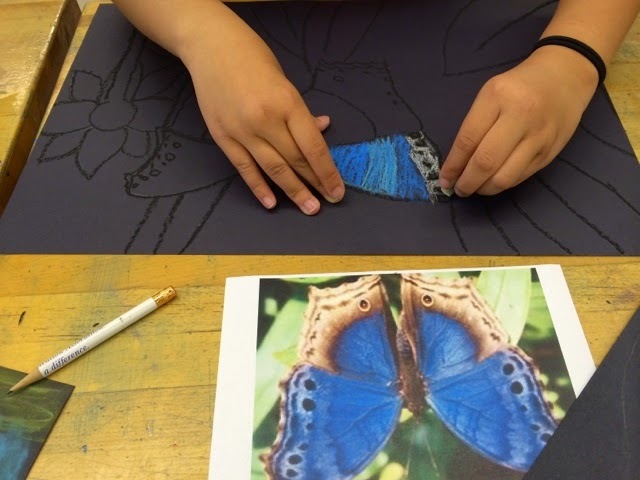 Then, once they are colored, students cut them out - CAREFULLY. I told them to cut off extra if it got in their way and to be careful because the metal can be sharp. LASTLY, students created an original habitat for their wild thing to live. Their habitat could be based on a real place: forest, jungle, volcano - or could be made up: candy land, new planet, an island made of cookies. The goal for their habitat was to use their drawing and coloring skills to communicate to the audience what/where the habitat was. So, if they did make candy land, then they would need to figure out what kind of shapes and colors they would use to communicate that to a viewer. 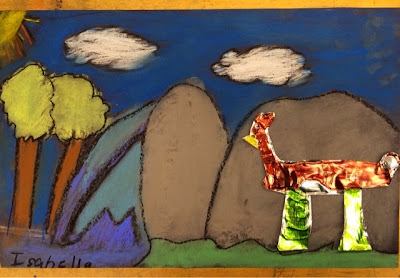 After they drew their habitats with a black oil pastel, they colored it in with chalk pastel. I ask the students to channel "Goldilocks" from the three bears when they color. This comment gets a variety of gut reactions from the kids that range from giggles to pure confusion. Quickly I ask them about the porridge - too hot, too cold and just right. The beds - too hard, too soft, just right. I explain that they need to color not too hard, not too light, but just right. Then they understand. 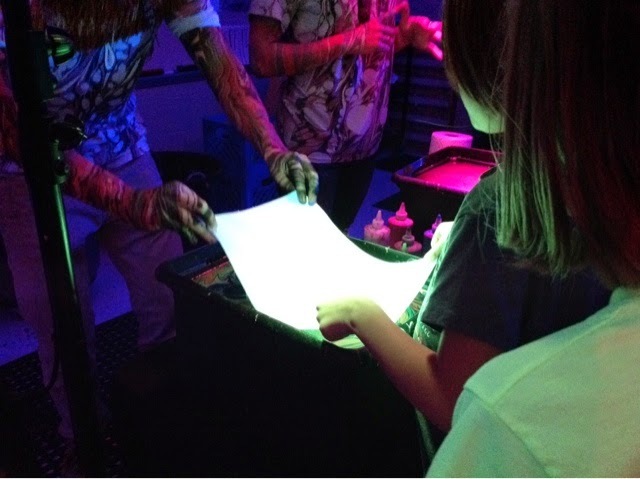 In their final class students blend their habitats starting at the lightest color to the darkest. Students bring me their habitat and wild things and show me where to hot glue their wild thing. Forgive the pictures - the pictures no where near capture the awesomeness of this project - metal is really hard to photograph! 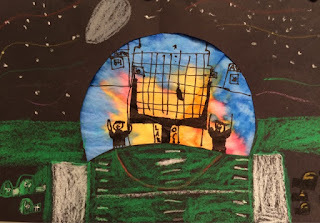 A few days after BLVisual's visit to my fourth graders - they sent me this video. It really captures the excitement, awe, and pure awesome from the day. When talking with my classes this last week many of them said, "If I had to score 1-10, I would say 100!" I can not come close to expressing in words the amount of joy, wonder, and excitement that filled my room yesterday afternoon. BLVisuals let each student pick their own colors for a bandana - swirl them as desired and help dip, rinse and dry. While students were waiting for their turn at dipping or simply trying to be patient while their creation dried - the group at BLVisuals brought along some fancy glasses that order colors in your depth of field. Hot colors in the front (closer to you) and cold colors in the back (further from you) giving anything with hot and cold colors an element of 3-D! It was amazing! Students loved looking at posters and their bandanas with the glasses. 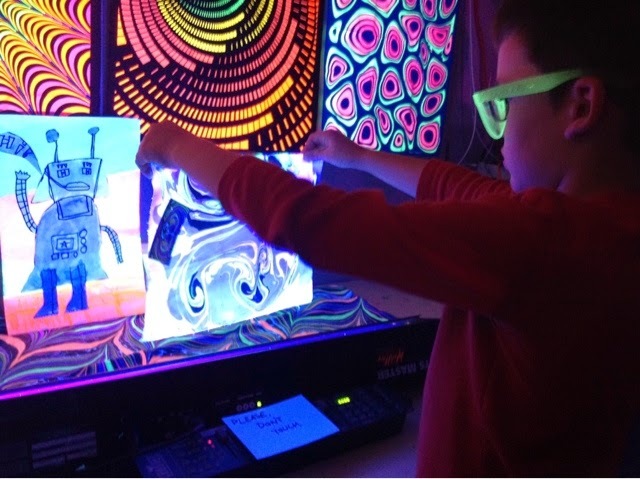 Students were also excited and encouraged to take their tapestry/bandanas and hold them in front of color changing lights - which in turn, magically, changed the colors on their bandanas! 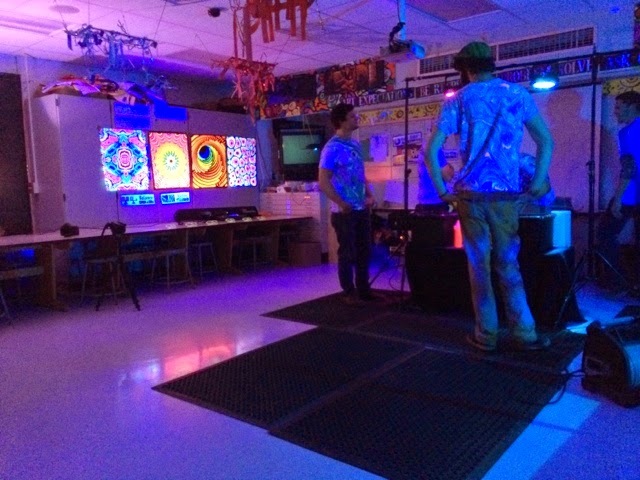 Every year each of the arts teachers in my building are in charge of bringing in an artist from our field. 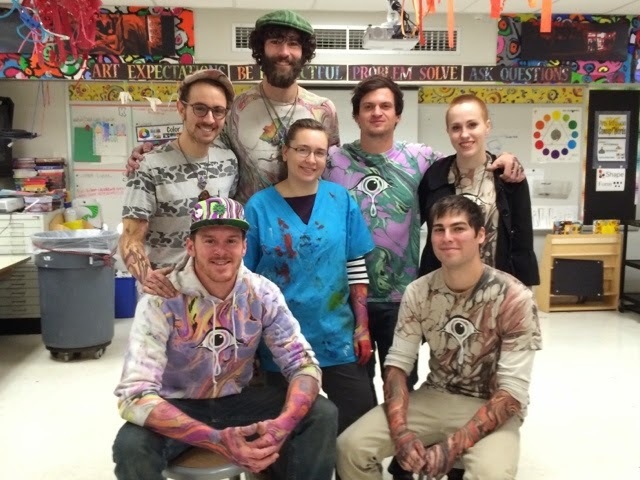 Our AMAZING PTO sponsors these visiting artists and their workshops for our kids. Pretty sure my students would describe the visit as "Best Day Ever". 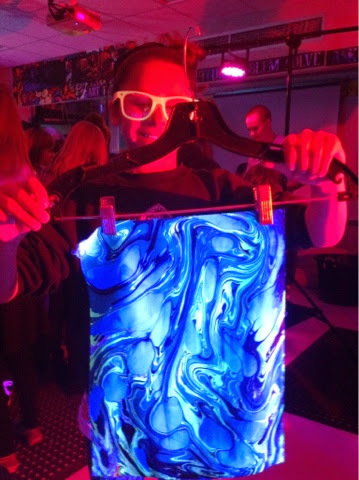 BLVisuals dips most anything fabric and frequently travels to festivals and dips patron's arms. 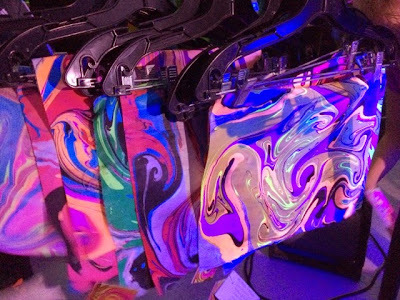 Their paint is a unique blend of acrylic paints - their beautiful creations on skin last about the length of a temporary tattoo while being permanent on fabric. It was a truly awesome day. Today ends the second full week of school. To be honest, it is finally starting to feel awesome to be back in the groove. This was the first year that I didn't feel ready to come back, I was mourning the loss of summer. I think a lot of it had to do with the fact that last year was a pretty rough year. There were a lot of changes in my school that I was struggling with embracing or even simply accepting. This year is a bit better, mostly because I am making a conscience effort to have a better attitude - to accept the things I can not change, and to embrace and love the things I can. There are better days than others, but it totally helps that I have some totally rockin' colleagues that are helping me to keep me accountable. On top of having an overall better attitude, I am rediscovering my love of teaching. I am remembering how much fun it is to teach art. Last year I felt annoyed quite a bit by my students choices and behaviors and while some of it was warranted - it was mostly me just being grouchy. So this year - a clean slate for all, including myself. I have set my standards high for myself and my students. I remind students quietly and gently (unless there is safety involved). I am hoping that if we can start out the year with love, trust, compassion, a sense of humor, and consistent expectations/consequences that the students and I can have an even more productive and highly engaging year. So far so good, though it still is the end of the second full week! I started off the year by asking students to show me about their summer on a piece of paper. I did this project last year and LOVED it. It takes only one day and I get to catch up with kiddos - I can start building those relationships with the kids that need a little extra love to feel comfortable to succeed. It gives me a chance to practice procedures and protocols without yacking at them for 50 minutes. I also have a chance to fill bulletin boards with work for curriculum night the first week of school. Our first 'real' projects began the next time I saw them. I am hoping to include some more 'skills' into their work this year without doing too many "draw like this" lessons. I really love having them be creative and stretch their own ideas - but I also am seeing some holes in their skills that I need to try and boost. For the upper grades (3-5) I am starting guided sketchbooks this year. Each day they come I hand them a half sheet with some kind of guided drawing/thinking lesson. The students then work on them for 5 minutes without talking. I am hoping these will help boost their drawing skills, their observational skills, their confidence, their patience, and even their problem solving skills - as I answer no questions during the five minutes, nor do I answer "is this right?". Before we started the sketchbooks I explained to the classes that it is about warming up the creative side of their brain. In PE, dance, or music they do warm ups to prepare their bodies/voices - in art we have to wake up the creative side of their brains. So far I have classes that really have embraced the 5 minutes and others really struggle with not asking for help or looking for the 'right' answer. I ask them to do their best and to work for the WHOLE five minutes. It has been interesting. So far it seems that the classes that really embrace the 5 minutes seem to be more focused on their work come work time - instead of it being social hour. I will try and remember to report back at the end of the year to reflect on how it went over the course of the year. After the students do their warm up sketchbook page for 5 minutes - they add it to their sketchbook and prepare for that days lesson. If students finish the day's lesson they go back and finish their sketchbook page(s) before they can do something off the Finished List. I am doing my best to step up my program in a way that we all work smarter, not harder -- hopefully my new school year resolutions will hold throughout the year! This week I had a small group of students come to art a few minutes early. I always love moments when I have just a handful of kids, especially the normally quiet kids, because I get a chance to really hear them. These students had just come from a pull out support group for reading. One kid, we'll call him Jeremiah, puts his head on the table, looks and me and says, "I don't like school." There was a pause. I am never really sure how to respond to this statement. He then proceeds to say, "I don't like most of school. I do like art and P.E." I asked him why he liked those parts of school. He took a second and said, "I like art because I get to do things like paint and create. In P.E. we get to run and play games." I can't remember what I said, or if class came in - this quick conversation not only made my heart break but reminded me of why I do what I do. I teach art for kids like Jeremiah. I teach art for kids that 'learning' is a true struggle. They have to work 3x as hard to learn the same information as "normal" kids -- everyday, for 7ish hours they struggle -- then 2ish times a week, they get to be "normal" - they don't have to work so hard, they can enjoy learning. I teach art for the kids that need a place to smart, to overcome their dyslexia, their ADD, their processing delays -- I teach art to gives kids a place to feel like everyone else, while becoming more themselves. Thanks Jeremiah for refreshing my perspective. 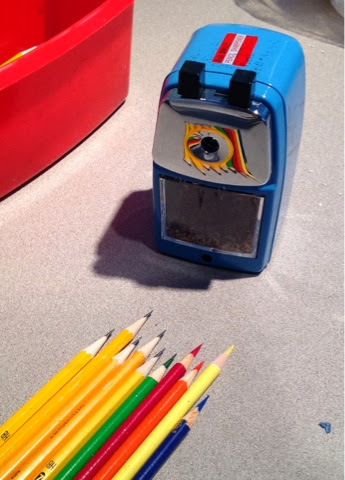 As an art teacher my pencil sharpeners get A LOT of use - and not the sweet gentle kind of use - but rough use - pencils, colored pencils, 800 kids a week kind of use. I gave in a few years ago and bought one of those 150.oo pencil sharpeners and while it's still kicking just fine - I have discovered this little hand crank pencil sharpener that does a way better job and wastes way less pencil. I e-mailed the guy at Classroom Friendly Supplies to see if he would send one to me to try and out and write a review of it on this blog. I warned him that it was going to be put through the paces in my art room and that I planned on using it for months before writing a review. 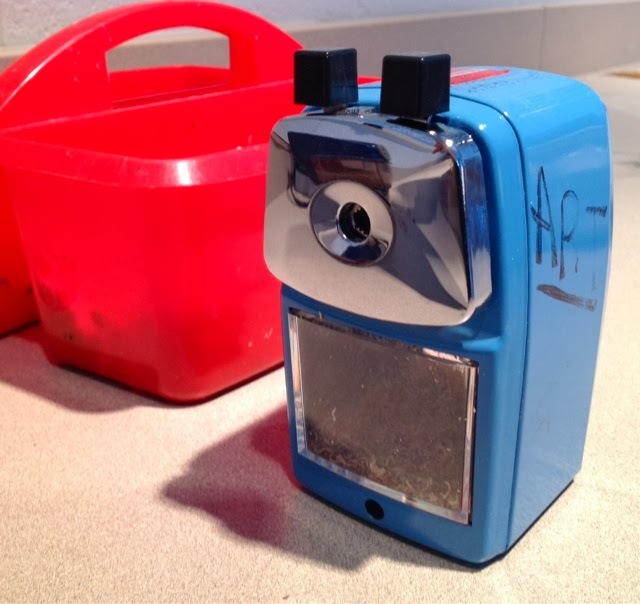 Most pencil sharpeners can hold out for a month or two in the art room before starting to spit, sputter, over heat and then die all together. 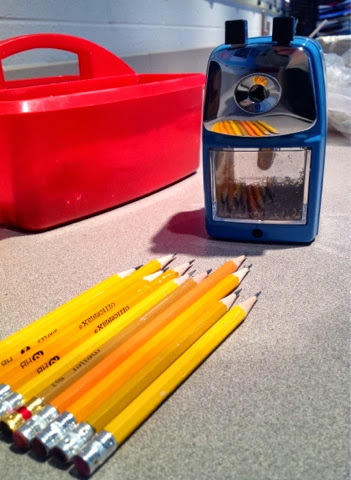 I received my adorable pencil sharpener back in the fall and I had seen other classroom blogs rave about how well it sharpens - they didn't lie. This little baby does it all and does it like a champ! I wasn't sure how it would do months later - but honestly, it's still sharpening like day one! - Sharpens pencils (both colored and normal) to a crazy amazing point. - Wastes less pencil - no over sharpening here! That it. I have found that it sharpens normal pencils perfectly every time. I had a whole bunch of economy pencils donated to my room - those really terrible cheap ones where the lead isn't centered in the pencil and the erasers make pink streaks on paper instead of erasing. I ALMOST threw them all away because my 150.oo pencil sharpener couldn't handle the crooked lead - they always sharpened having one wood side really long and no way to write with the lead. On a whim I tried them in the Classroom Friendly Sharpener - and wha-la, they were sharpened just like any other pencil. Later in the year we were doing a project with colored pencils and colored pencils are terrible for normal pencil sharpeners. The colored lead is way softer and almost gummy - it messes with the blades and motor of normal pencil sharpeners. Most art teachers won't allow colored pencils and normal pencils to be sharpened in the same sharpener. Kind of like having paper scissors and fabric scissors - same idea. In my opinion I don't have time to hand out hand sharpeners to kids and then police them to make sure the shavings get in the trash or that they aren't making rosettes out of the sharpened pieces... so I just have the kids use the electric sharpeners, which is hard on the sharpener. See the circle of issues?!?! Okay. So I took my Classroom Friendly Sharpener and I put it to the test. We sharpened colored pencil after colored pencil. It sharpened them BEAUTIFULLY. The only thing I had to be careful of was that the over sharpening protection for normal pencils doesn't work with the colored pencils - the lead must be too thick or too soft. About 4 full cranks and the colored pencils were sharp. The only other issue was that the lead of the colored pencils would occasionally break in the sharpener and I'd have to take the blade out and get the lead out. This extra step took about 30 extra seconds when needed - nothing crazy or hard. The best part was that after sharpening all those colored pencils, the next class needed normal pencils - and it worked just like it did when I pulled it from the box. This pencil sharpener in the REAL DEAL. Kids love using it (even so much that one class I had to take it away because they were purposely breaking their sharp pencils to use the sharpener again and again). So if you are tired of burned out sharpeners that seem to last a few days past their warranty and then sputter and die - get yourself one of these sharpeners! It has been used EVERYDAY by hundreds of kids ALL year and it's still going strong. 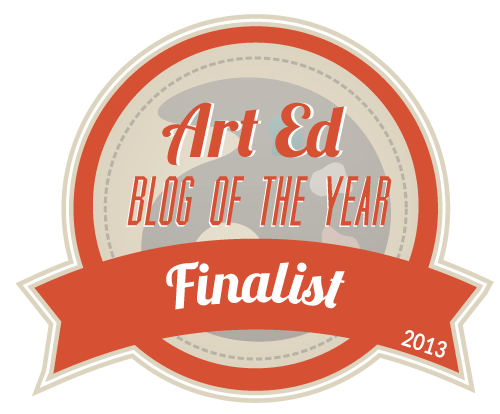 It's been a CRAZY week, but I found out that I am a finalist for The Art of Education's "Art Ed Blog" contest. hooray! The first year I ranked 4th, last year 1st -- this year is yet to be determined. Here's the kicker - the contest ends tonight February 7th. So don't delay! Today - January 31st is the LAST day to nominate your favorite Art Ed Blog(s). Don't assume your favorites are already nominated! All you need to do to nominate a blog is click on the link below and leave a comment stating which blog you'd like to nominate and why you love it. A very eloquent and wise man, Sir Kenneth Robinson, once said, "If you're not prepared to be wrong, you will never come up with anything original". Not only do I feel this statement is very much true - but it happened in my classes the other day. 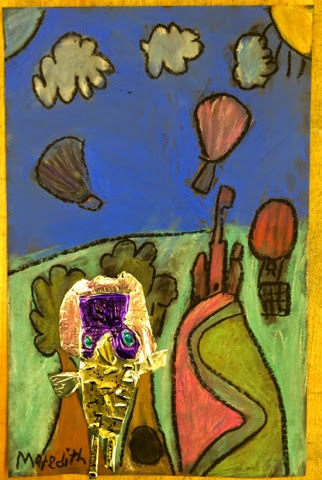 I was working with my 2nd and 3rd graders on their piece of artwork for Young Masters. I always do projects that are high success, but also highly original - I decided that 2nd and 3rd graders would be doing zentangles this year. I know all my students can create with lines and shapes, but this would be one of the first times I would not be allowing pencil first - but straight to Sharpie. So we go on with the video and notice they use squares, circles, dots, straight lines, coloring in spaces and leaving other spaces open. We discuss pattern and rhythm in each section. I then asked the students if they know how to draw straight lines, curved lines, squares, circles -- etc. They agree they know how and are starting to get real excited. 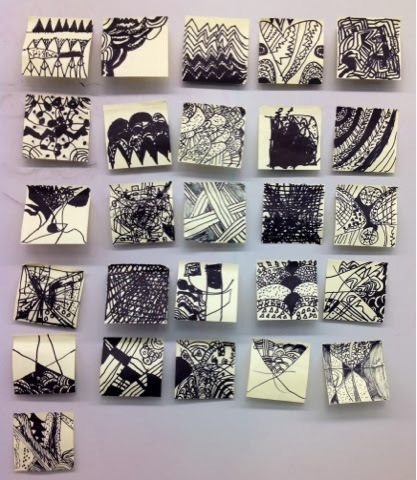 I then explain that they will be doing a warm up zentangle on a post-it. They will be doing it with a Sharpie and any 'mistakes' they make will need to be problem solved and pulled into their design. This is where it got interesting. At one of my school the kids were excited and ready for the challenge. In fact I had to wait multiple times for them to stop talking so I could finish my instructions - they were so excited they couldn't wait to share their ideas! They were jumping at the bit to skip pencil and use sharpie straight away! So then at the end of the week I went to my other school and these kids panicked. Full out, panicked. They were almost arguing with me to use pencils or to get an extra paper incase they messed up. I spent far more time with these kids building up their confidence and convincing them they would be fine. The post it note was just practice and it was okay if they didn't like it in the end. Whats the difference between the schools? Socioeconomic? Atmosphere? Personal relationships? There are many small differences between the schools - but they are mostly the same. My kids at the school that panicked are often better at following rules and expectations, but their socioeconomic status is similar to the other school, and most of the kids, at both schools, I have had 2 or 3 years -- so our relationship is pretty strong. I personally believe that the reason I had students in one school panic and the others not is due to the fact that non-panic school is a school of the arts. My school that is a school of the arts is NOT a fine arts school. We are not a school that trains kids in the arts - we have no band or dance troupe. Instead we infuse arts into the whole educational system. Students transfer and connect ideas between classes - they learn about texture and patterns - they are asked to compare relationships, look for symbols...etc across disciplines. These students also have dance and drama in addition to their 'normal' special schedule. Kids that come to the school for the arts are continuously asked to take chances, take risks, throw out an idea, perform in a small skit, join in conversation, think about something from a different point of view, problem solve and critically think about questions. Students at this school are prepared to be wrong, to make mistakes. Students at this school are encouraged to take a chance, and are supported through their thinking/exploration. While music and art provide this -- dance and drama really help to drive these concepts and ideas home. Asking kindergarteners to act out simple fairy tales, teaching 3rd graders to do improv -- it not only enforces their reading/writing skills -- but teaches them to 'prepare to be wrong'. In dance they are asked to come up with movements that inspire or represent a concept/word/idea. Students at this school are asked to explore answers instead of giving the correct one. Now, lets take a moment and realize that my other elementary school is VERY supportive of their students. Students feel safe and get a an amazing education there. Students are very thoughtful and take learning risks there as well -- but in a different fashion. I truly believe that both my schools offer an exceptional education to students and the point of this post is not to give more props to one over the other, but to try and understand why two similar groups of kids would respond so differently to the same project. Back to the project. As the students were doing their warm up post-its. I had them work silently for 5 minutes. I wanted the to really concentrate on their visual thinking and felt talking would be too distracting. After the 5 minutes was up - I let them share their ideas from their tables, then bring them to me. I put them on the board and we quickly discussed that when they were working on their 'final' paper that if they needed some inspiration that they could come look at their class's thinking for ideas. It is important to note that after the warm up both schools were ready and raring to go, and that their warm up thinking/solutions were very comparable. The warm up provided my traditional elementary school students with the chance to be wrong and when they worked through those mistakes without an eraser or a new paper - they had the confidence to be original, just like my school of the arts kids. So in the end both sets of students had the same outcome - but that initial jump into a project was so very different. As much as working at two buildings can be frustrating - moments like these, I find fascinating. But even though I have struggled more with this, this year - I by no means plan to give up or give in - I am far too stubborn for that. In times when I feel this way the song Ten Thousand Hours by Mackelmore and Ryan Lewis always gives me a spark of energy and truth. This is not the whole song, and I have underlined the parts that feel so very real to me. Take that system, what did you expect? I have been wanting to write this post for a while - but I wasn't exactly clear on what I wanted to say - or I guess more how to say it. In fact, I am still not sure - but it keeps rolling around in my head and needs to get out, so here goes. When I first started in the district I am at - 3 years ago - I was both excited and nervous about the idea of having CI students. Turned out that the way the schedule fell I didn't have them - the other art teacher in my building did. To be completely honest I was disappointed, but mostly relieved. I was nervous about starting in a new district and I had NO idea what to do with kiddos in a CI program. Over the years I have been itching to get time with them - but again the schedule kept them with the other art teacher. Then, this year it happened - the schedule was changed and not only did I get them, but so did the other art teacher!!! Instead of having art once a week for 50 min (which is really not appropriate for the level of student) - they have it twice for 25 minutes! It's really brilliant. So I started to think about things I could do with my new students - and I realized that I really had NO idea what I was doing. I tried to look on the internet for things, pinterest... I looked for blogs. Honestly, I found little to nothing for art. I found tons of picture charts, adaptive tools for the grade level teachers - squat for me. I dug out a textbook from college called The Special Artist's Handbook. This gave me some actual information I could work with. I was excited and also totally overwhelmed. My first class with them, I was a nervous wreck - it felt like my very first day of teaching all over again (which it kind of was). I had read quick bios about each kid, but those rarely help me until I can put a face to the information. It is hard for me to understand that Jessica might bite if you are too close, and that Michael needs to be apart from Sally...... that is until I meet them - then it all makes sense. I decided there was nothing more I could actually do to prepare other than to just jump in. It was time for some trial and error. I have had the kiddos once a week since September and here are some things I have learned. 1) Baby wipes. Have a lot. Buy a container and then the HUGE packs of refills. A lot of my CI kiddos HATE being messy - even if it's just marker, they will want it off before they move on. So - have baby wipes. It's faster and easier than running to the sink every couple of minutes. 2) Be prepared to have a HUGE range of abilities. I have two separate groups and even within those groups their skills vary A LOT. In both groups I have students that are non-verbal. In both groups I have kids who will talk all class. Some kids can cut on their own and write their own name - while others need assistance to cut and write. 3) Be prepared to laugh and smile. The more I get to knows these kids the more I come to really appreciate and love their individuality. 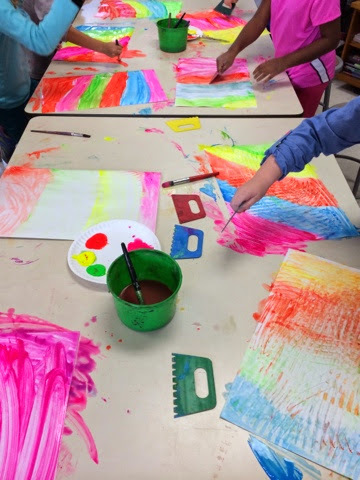 They tend to surprise me - not just in their artwork - but when they come to class in a super mood and are silly all class, or are extra helpful, or even how they communicate without words. 4) Music Videos. I'm not talking MTV - but Sesame Street, kidsongs, Harry Kindergarten. They love to move to the music - dance - sing! 5) Be prepared. 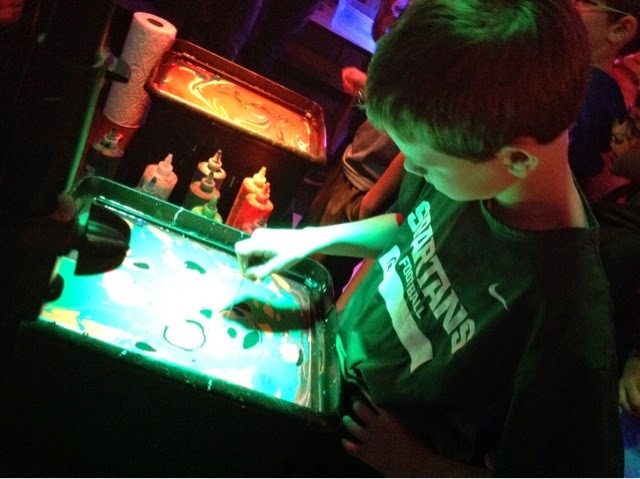 I am still trying to find materials and projects that are both engaging but not too hard for my students. I often think something will take them 15-20 minutes and they will be done in 5. Or something I think they will enjoy for only 5 minutes will keep them engaged for the whole 25 minutes. Be prepared with a back up plan - and maybe your backup should have a back up. 7) It's a challenge. It is definitely a challenge - but I truly love my time with these kids. I am learning a lot about these kids, about society, about me. I am doing my best to embrace it and learn everything there is to learn. 8) Absent. At least with my kids - they are absent a lot. The kids are out for doctor appointments, or are kept back in the classroom because their choices and behaviors are too wild and inappropriate to venture to art..... Kids will be absent. I try and do one day projects because of this. It is hard to have 3 kids working on something from the week before while 2 others are doing something else. 9) Ask questions. I asked a lot of question up front. I asked about personalities, I asked about sensory, I asked about abilities - ask questions. Let people know you are open to suggestions. 10) Play. Take the chance to play. Today we were done drawing and danced around the room to What does the Fox Say? They loved it and so did I. 11) No Control. Be prepared to feel like everything is wildly out of control - even though there are many adults in the room - prepare for a Murphy's law day. Anything that could go wrong, will. When it happens - remember safety first, then clean up the mess. 12) Rely on a balance: Keep a balance of your own intuition and those of your para-educators. The paras are with the kids all day, so I tend to lean on them with communication or how to get kids to respond to certain directions. I perhaps lean on them a little too much - but they are teaching me how forceful I need to be with my voice, or what words/commands the kids know, what signs they know or what particular grunts mean. It also helps when one of the kids is 'off' - whether its a kiddo that has extra energy, no energy, doesn't feel well, or keeps squawking. The paras almost always know what they need. One of our students one day who isn't verbal wouldn't stop crying/yelling -- took off their leg braces and the kiddo almost sighed with relief. There happened to be something in their sock that was uncomfortable. I would have NEVER thought of that -- but I will now! I hope in the future to find someone or something that will help me on this journey. I feel like there is a whole ocean of information I could be using - but I haven't found it yet. I often feel like I am shooting in the dark - hoping things will work. I'd have to say, more lessons have worked than haven't - but I also don't feel like I am doing enough. I figure each class teaches me something new - don't give crayons to Erica (she eats them like carrots), Joseph likes to be in Abby's space - but Abby bites. Karley can use scissors on her own, but Brian needs help. Cathy likes to manipulate small items, but also likes to stick things in her mouth. Sally is always eager to share her ideas, and Riley doesn't talk or watch but somehow always know what to do. I could go on and on about the differences between my kiddos - it's great. They are great. They teach me more and more each class. I will continue to plan lessons and watch which ones work (puppets and bleedable tissue paper seem to be the biggest hits so far) and which ones don't. I will continue to learn about their abilities, their personalities, and how the communicate with the world. One class at a time. I just got back from a Arts Integration Seminar/Conference thing. The day was helpful, but perhaps not in the way the presenters expected or hoped for. I left the conference today with a love-hate relationship of arts integration and a further understanding and passion for arts infusion (which my home teaching building is based on). 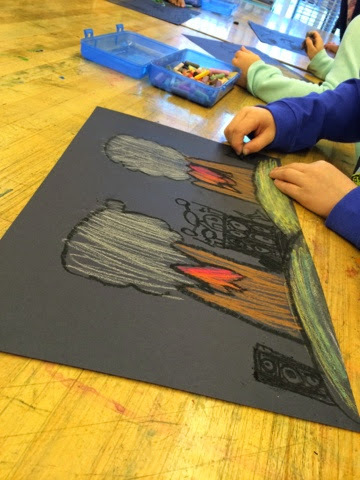 Today was all about arts integration - how to integrate core subjects into art. While this sounds amazing and something that would benefit everyone, there are a few drawbacks that weren't discussed today - or perhaps others don't see them as drawbacks. When it comes to arts integration, I have a love-hate relationship. Which comes from the fact, or my interpretation, that it is all about connecting core subjects into the arts - but not the other way around. 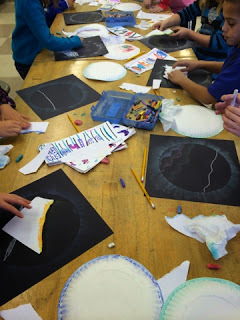 Rarely are there grade level teachers looking to find art standards to fit into their subjects - if anything they look at their core subject and try and add art. The presenters today stressed that true arts integration would hit standards in both the core subject and the art subject at the same time - making them equal partners in the project. Don't see an issue with that? I didn't at first either - I thought "Great- I love this! 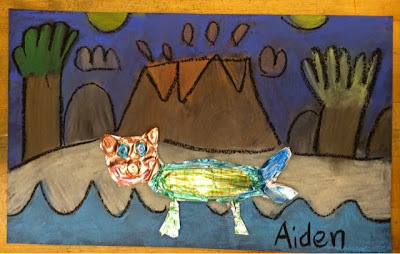 - Kids learn about pattern and texture in my class anyway, why not teach it through the african animals unit the 1st graders are learning about in class." Then is slowly started to sink in - the hate of arts integration. So wait, the core teachers teach what they teach and then I bend my ENTIRE curriculum around what they teach. That doesn't seem right, but if it is better for the kids - then okay I can get past that. Then I started to think more about how I would have taught patterns, with out integration - perhaps the kids are missing out on a bigger world and a bigger picture if I teach it focused on African animals. Perhaps I was going to teach pattern and texture through famous artworks and illustrations like Vincent Van Gogh and "Where the Wild Things Are". So now the kids don't know about patterns and textures in other contexts - but they know A LOT about African Animals. I suppose you could argue either way for which one is better. Do they master one subject or have knowledge of many, but mastery of none? But wait -- maybe we are missing the whole point!! Was the point that the kids learned about African animals or was the point to learn about patterns and texture or both? If the point was to learn about African animals - then the arts integration did it's job just fine. If the idea was to enhance and learn about texture and patterns then arts integration failed the students, because it pigeon-holed their learning experience. This is where my deeper understanding and growing passion for Arts Infusion comes in. If the idea was to teach kids more about the concept of patterns and textures than about African animals - then using different world experiences to explore this concept is better. For example when they come to art and they look at Vincent Van Gogh they can use that prior experience with the animal print to understand texture in a new way. They will read the illustrations in 'Where the Wild Things Are' and have another understanding of pattern and visual texture. - it will help them understand quicker but also deeper. Perhaps then when they go to music, in a month, and the word 'texture' and 'pattern' shows up there they will be able to expand their thinking even further - deepening this concept that keeps popping up. THEN, what if when they are learning long division they recognize that there is a pattern - which helps them learn long division faster and deeper because they understand truly what patterns are. Once you learn about African animals, you can compare them to other animals - but that doesn't translate to math very well. This, to me, seems like a better use of my time and my student's brains. Could I do projects that coordinate with grade level curriculum - sure could, but not a normal basis - (there are times for integration, more on that later.) I will, however, provide opportunities for my students to connect concepts and ideas across subjects and ideas. This, I feel, will deepen my students learning as well as enhance their own education - it provides the students with the control of their learning as opposed to me telling them what they should learn. In other words - which might be more concise than my reflective ramblings above. Arts Integration: Art Subject = Core Subject Standards in both should be equally met and explored. This is planned by the teachers, it is quantifiable. 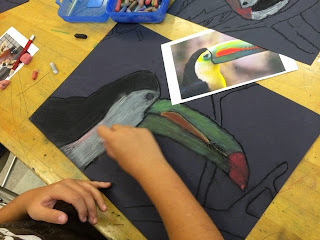 The arts are USED to enhance core subjects. While the quotes from above are from the same "Definition" of arts integration - I feel they mean different things, thus why they are split for me. Often times people use "arts integration" and "arts infusion" interchangeably and I don't believe they are the same thing. Arts infusion can be arts integration, but arts integration is not arts infusion. I feel arts infusion allows the arts to be as they are - to be honored as their own curriculum, their own history, their own specialized field that has something to give to humanity. 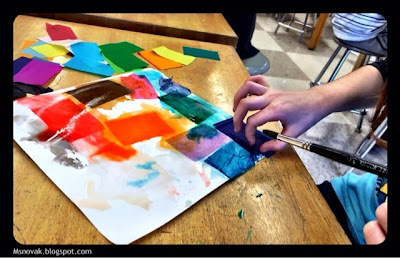 Where in arts integration I feel the arts become second to the grade levels - less important, and used as a tool. I strongly feel that the arts have plenty to offer and can stand on their own --- they don't need to be watered down and attached to math problems. Visual art, music, drama, and dance connect us as humans - all the arts have been with us since the beginning of man. There is no reason why the arts can't be important on their own and still contribute to core education. 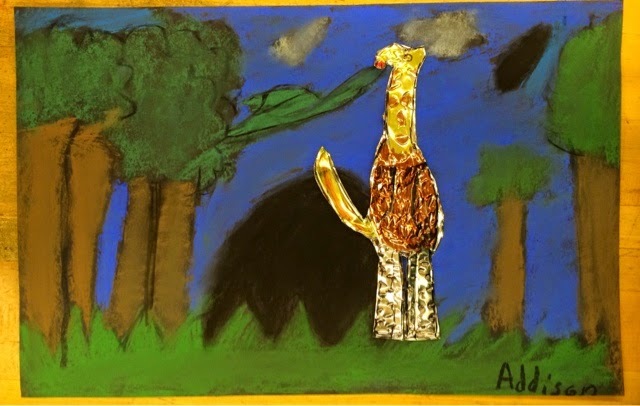 I believe it should be done through connecting concepts (pattern, categorizing, visualizing...) instead of connecting subjects (african animals, pilgrims). The world is so much bigger than subjects and it seems to me that students would be stronger thinkers and problem solvers if they learned to see connections between events rather that a specific event. Now, don't get me wrong learning A LOT about a specific event is valuable and needed, but, I believe, in moderation. Arts integration does a fabulous job approaching a specific theme/event from different perspectives - which, in the right context I love (back to that love-hate of mine) and find valuable. more to offer to students. Arts infusions asks students to make connections and be present with their learning - where arts integration lets them be more passive. 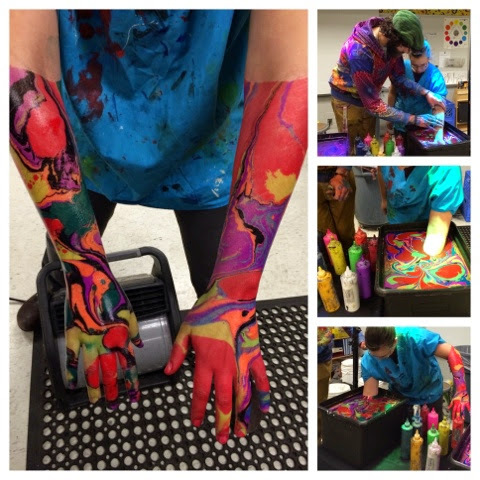 Overall - both arts infusion and arts integration provide kids with deeper experiences surrounding their life. Neither is bad nor good - neither is right or wrong. Do I think one provides more opportunity for deeper thinking - yes. Does one do a better job mastering knowledge of one event - yes. 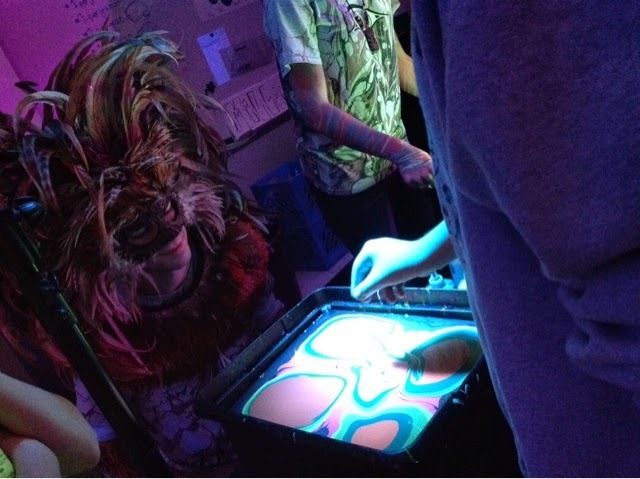 iPads in Art Education - Why iPads?